In every classroom I have walked into, every interview I have had and every first meeting with a stranger, I get asked about one thing in particular: my last name. “Are you actually Hispanic?” they ask, “Are you sure?” “You really don’t look Spanish,” “You look too white.” I respond by explaining that my father was born in Havana, Cuba and that a lot of Cubans have paler features coming from a mix of European countries. I am the mixture of a family who moved to this country just one generation before me and a family who came here shortly after the Mayflower landing. My Spanish is broken and lacking, but it was my first language. I may not look like the expectation of a Cuban, but it is my heritage just the same. Last year, as a freshman at UT, I found out about the school’s relationship with Cuba. Students who have visited through baseball or the travel program would shower me with their stories of the beautiful land, rich in history and natural wonder. How could I not want to visit? It would be beyond amazing to see the place where my dad was born, to understand where half of my family comes from, to see an island with both mountains and beaches– a land untouched by the modern world and paused in time back to the 1960s. I called my mom and told her that I wanted to do the study abroad program to Cuba. She told me that she was not sure how my dad and his family would feel about my traveling to the land they had to leave behind, and, even worse, allowing my father’s hard-earned money to make its way to the Castro family. Growing up, I would hear my abuela and abuelita (my great-grandmother) and tia and tios talk about Cuba. While the younger of my family members all assimilated to American culture, the older ones always imagined returning to Cuba one day. In their minds, moving to the U.S. was just a stage, one they would move past so they may go back home the moment the regime fell. Sadly, the regime didn’t fall in my great-grandfather’s lifetime, it didn’t fall in my grandfather’s lifetime, and, with the U.S.’s reopening of relations with Cuba, it is doubtful that the regime will fall in my father’s or even my own lifetime. This island, wonderful in its ability to take you back in time to a simpler era where everyone drives classic cars because that’s all they own and no one carries a cellphone and there is no McDonald’s in sight, is sure to catch up to the modern world now. Right now, Cuba still looks precisely the way my father and his family left it, as if someone sat on a remote and just forgot to press play for 50 or so years. Maybe that’s not all bad; no one, including the Cuban people, deserve to be stuck in the past. It’s just sad to think that Cuba is a beautiful picture of another time and that picture is beginning to fade. More than the issue of losing touch with the past is the idea of keeping the Castro family in power any longer. This family took everything from those who barely had anything. This family took land in Taco Bay belonging to my mother’s family. This family limited the basic human rights of my father’s family. The Castros are not presidents, they are dictators. The power that Fidel passed down to his brother Raul will continue to be passed down to leaders who share their viewpoints. Perhaps keeping ties with Cuba closed was not helping, but by opening ties we are admitting defeat and saying that since we can’t figure out a way to keep these people from a communist life they never asked for, we give up and we’re just going to make nice. I want to go to Cuba. I want to breathe in the history; I want to experience that world so different from mine. I want to walk where my father took his first steps. 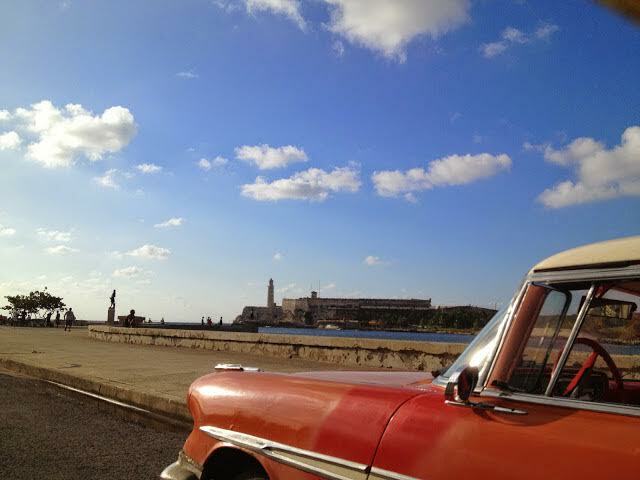 But every time I consider taking a travel course to Cuba, I am trapped between two worlds. One is the world where I hate and refuse to support everything that government stands for. The other is the world of nostalgia, where I just want to visit the island because if I don’t do it now, when will I? If I don’t visit soon, will I never see Cuba in its uncommercialized state– or possibly, will I live like the older generations, waiting so long for Cuba to go back to what it was that I just miss it entirely?